Looking to add a little something different to your coffee order this week? Or are you simply just over pumpkin spice already? These 5 spots have upped the ante for the rest of cafes across the city with their elaborate recipes. Check them out for your morning grind this week! The Golden Latte at Cafe Clover in the West Village is the definition of extra. Made up of fishtown espresso, turmeric, cinnamon, black pepper and gold leaf, the seriously decedent $9 latte will be the pick me up you need to get through the week. This intense latte is made with espresso, steamed graham-cracker infused milk, dark chocolate, cinnamon and is then garnished with a salted caramel marshmallow. The marshmallow is torched and the whole drink is served in a bell jar smoking with hickory wood chips. Only 10 are served daily so if you want to get yours, make sure you get there early. The Unicorn Latte actually doesn’t have any caffeine. This refreshing drink gives you energy (and the bright blue color) from the E3 live blue green algae. It’s full of fibers, nutrients, and amino acids that your body needs. And according to their website, the drink helps fight inflammation, clears brain fog and helps with mood balancing. 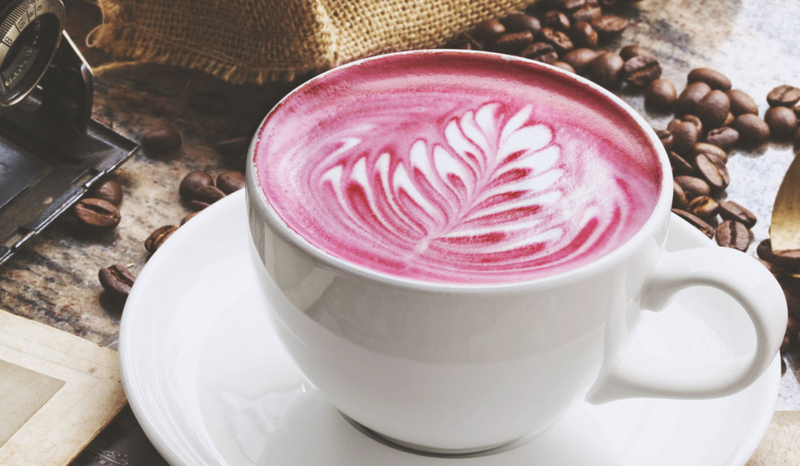 Who doesn’t love latte art? These bear-y delicious matcha lattes are made with a little extra love at Cup & Cup in Midtown as the barista takes the time to add a decorative detail to each one. While the Rose Latte at Blank Slate Tea doesn’t actually have any caffeine, it’s a nice treat for your stomach and your Instagram. While your there you could accompany this pretty pink drink with a pretty pink toast as well. Yum!